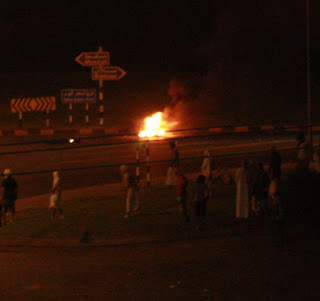 Well it seems that there were some upsets in Sohar last night, with reports of people burning tires in the street and massing at some round abouts. It's been written about on an Arabic forum, www.omaniaa.net here (English Google Translate here) and the pictures posted on the blog are taken from that forum. Coincidentally, local Sohar bloggers Dan & Jillian blogged this morning that there was heavy police presence at a round about in Sohar, presumably a result of last nights excitement. It does not look anything like the scenes we saw before earlier in the year, and at the time of posting, the main road through Sohar is open. More news if it develops. "Eleven teenagers watch something burn on a pavement..."
Shocking. Actually it is, but personally I'm more reassured than alarmed by the rapid (and quiet) police response. There are rumours that the protests are about to resume in Salalah and Sohar re jobs etc.